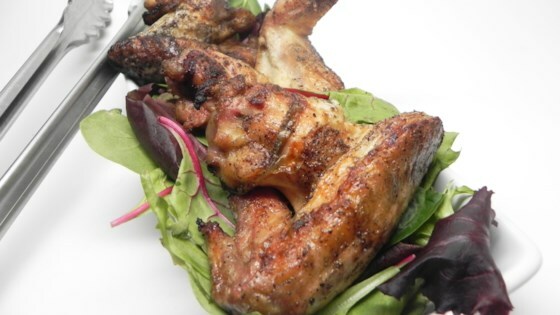 "Simple grilled chicken wings for a backyard get-together. They have a good flavor and look good. Add your favorite dipping sauce or enjoy as-is." Tuck in the chicken wing flaps so the wing forms a triangle. Combine olive oil with some of the garlic salt and pepper in a large bowl. Add a few chicken wings and turn to coat with seasonings. Add more wings, remaining garlic salt, and remaining pepper and turn to coat. Repeat until all wings are coated. Place on the preheated grill. Grill until wings are well browned, tender, and no longer pink at the bone and juices run clear, turning several times and rearranging them so they cook evenly, 30 to 40 minutes. Tender and juicy grilled teriyaki chicken. Easy indeed! Sometimes simple is best and this recipe is a perfect example of that.